I’ve been in the grip of a nasty flu all week. Drinking loads of hot beverages and not really tasting them but the warmth has soothed my sore throat. So, this morning I veer from my usual tea path and offer my thoughts on an indispensable herbal for relief of your cold or flu symptoms. It’s also great if you’re not sick and find the inside heated environment too dry. Throat Coat is an herbal blend created by Traditional Medicinals, “a socially responsible and environmentally conscious company, providing the highest quality botanical products with a balance of responsible business practices as its guide”. You can find their products and this herbal “tea” at any of your local grocery stores. It contains licorice root, wild cherry bark, bitter fennel fruit, cinnamon bark, sweet orange peel, slippery elm bark and marshmallow root. 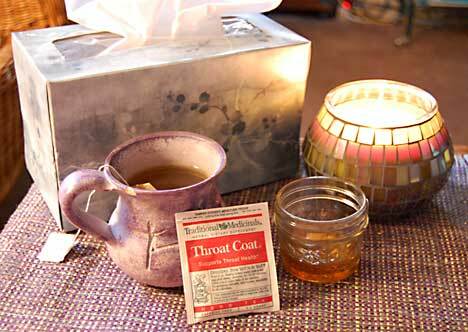 These herbals are wonderful for soothing a dry and sore throat. I drink this blend regularly throughout the winter and quite a lot of it in the last week. I am hoping that by next Saturday this flu will have loosened its grip and faded away and I will be able to resume my usual tea review. This entry was posted in Herbals and tagged tea for the flu, Throat Coat. Thanks Shelagh. Wow, we do have the same blog name. Thanks for visiting!